Successfully Added External Battery Case for Samsung Galaxy S6 Edge Plus - 5800mAh Capacity, 4 LED Power Indicators to your Shopping Cart. The Samsung Galaxy S6 Edge Plus is a beautifully designed smartphone with a breathtaking 5.7 inch screen that wraps around both sides of the device. The smartphone is a work of art in its own right. However, it comes with a 2600mAh battery. That means, that you probably won’t be able to get through the day without the need to recharge it. With the 5800mAh external battery case for Samsung Galaxy S6 Edge+, you will have a reliable battery backup that will let you get the most of your beautiful smartphone throughout the day. The compact and powerful battery case is made specifically for your Samsung Galaxy S6 Edge Plus and will fit perfectly onto the back of your phone. Despite its large battery capacity, the phone won’t add too much bulk to your phone. However, the 5800mAh of extra battery power will do wonders for your mobile experience, allowing you to make lengthy phone calls, chat online, enjoy your media, take pics and browse the web without worrying about the battery letting you down. The 4 LED power indicators will keep you updated about your expanded battery status and let you know when it’s time for a quick recharge. 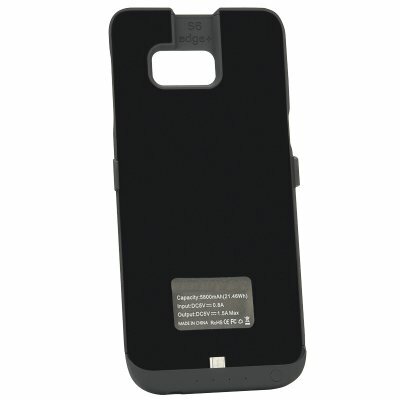 The External Battery Case for Samsung Galaxy S6 Edge Pluscomes with 12 months warranty. Brought to you by the leader in electronic devices as well as wholesale external battery cases, Chinavasion..